Tell the USDA and the Governor of New York and New York State Department of Conservation to send turkeys to sanctuaries. 1. Protest to the New York State Department of Conservation. Urge that the turkey roundup be stopped and that the turkeys be permitted to go to sanctuaries that have offered to take them. Request a written reply. The wild turkeys of Staten Island have roamed freely since 1999, when a local resident freed nine wild turkeys, previously kept as pets, at the South Beach Psychiatric Center near Ocean Breeze, NY. 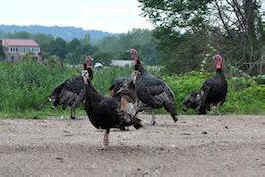 The turkeys have multiplied into hundreds and even survived Superstorm Sandy. On August 12, 2013, USDA agents rounded up wild turkeys on Staten Island for slaughter. The "capture removal" operation started early in the morning, carried out by personnel from the U.S. Department of Agriculture (USDA) wearing blue T-shirts marked USDA, according to eyewitnesses. Using pellets to attract the birds into large black nets, "they were picking the turkeys up by their necks and feet, and throwing them into plastic crates," one psychiatric center worker, clearly upset by what she had witnessed, told the Staten Island Advance. The birds were piled four crates high in the back of two white pickup trucks, "and then they just let them sit," she said. Buttressed by an outraged public, a rally was held by John M. Mancuso and GooseWatch NYC, and several elected officials and advocacy groups intervened on the turkeys' behalf. However, GooseWatch NYC reports that the USDA is planning another brutal roundup of the turkeys in Spring 2014.